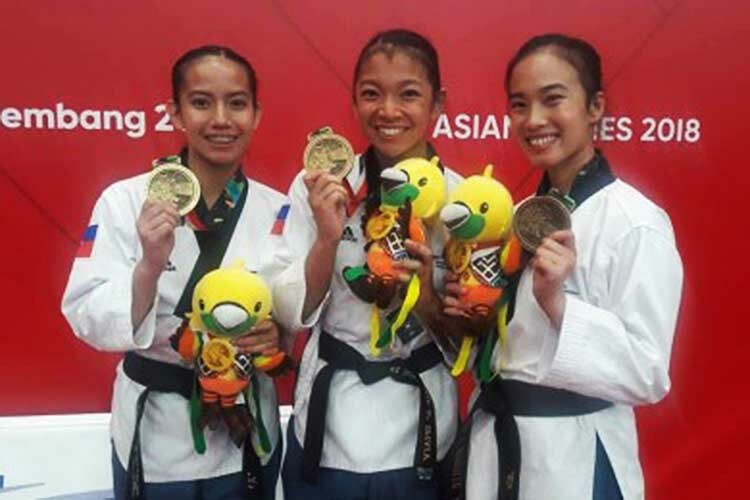 AKARTA — The Philippines collected two bronze medals in poomsae taekwondo, which has debuted in the 18th Asian Games here on Sunday. The men’s team of Dustin Jacob Mella, Jeordan Dominguez and Rodolfo Reyes Jr. settled for the bronze medal after losing to the Chinese squad composed of Zhu Yuxiang, Hu Mingda and Deng Tingfeng. The score was 8.180-7.830 points. In the other semifinal match, South Korea defeated Vietnam, 8.420-8.320 points. To reach the semifinal round, the Philippines beat Iran (8.330-8.100) and Saudi Arabia (8.000-7.490). The women’s team of Juvenile Faye Crisostomo, Rinna Babanto and Oliva Janna Dominique marched into the semifinal round following victories over Hong Kong (8.000-7.490) in the round-of-16 and Indonesia (8.070-8.040) in the quarterfinal round. However, the Filipina jins failed to advance to the championship round after losing to Koreans Gwak Yeo-won, Choi Dong-ah and Park Jae-eun (7.110-8.020). Thailand defeated Chinese Taipei, 7.950-7.650, in the other semifinal match. In the men’s individual event, Rodolfo Reyes Jr. was eliminated in the quarterfinal round after scoring 8.080 points as against Thai Pongporn Suvittayarak’s 8.320 points. Reyes, a bronze medalist in the 2017 SEA Games, defeated Kazakhstan’s Ruslan Manaspayev, 8.080-7.080, to advance to the quarterfinal round. Incidentally, Reyes was also beaten by the Thai in the final round of the 2017 Asian Indoor and Martial Arts Games in Ashgabat, Turkmenistan. Jocel Lyn Ninobla had an early exit when she bowed to Vietnam’s Tuyet Van Chau, 7.890-8.100 points, in the round-of-16 of the women’s individual event. South Korea won the men’s team event over China (8.480-8.020) while Thailand defeated South Korea (8.210-8.200) in the women’s team event.